It’s hard to believe that another month has passed and that it is already April! Last month, I provided a broad overview of the historical context that led to the creation of Geoff Stirling’s Captain Newfoundland character and argued that the character is the embodiment of the media mogul’s philosophies. 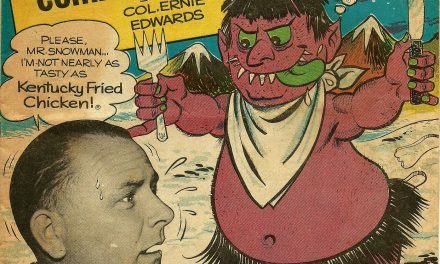 Captain Newfoundland was an ambitious (and outright bonkers) comic book project released right in the middle of the Canadian Silver Age. The sequel is absolutely gorgeous. This month, I will provide an overview of the Atlantis graphic novel story before discussing the legacy and collectability of these two rare comics. Cover of Atlantis from my collection. Art by Boris Vallejo. The follow-up graphic novel, Atlantis, does not begin where the first volume left off. Instead, it reprints the entire Leif Erikson story in full colour. This time, the story is called “Captain Atlantis.” Rather than being split into long chapters, Atlantis is split into chakras that are interspersed with words of wisdom. The remainder of the graphic novel consists of new material and focuses on Daniel Eaton’s Captain Canada character. The story picks up from where Captain Newfoundland # 1 left off regarding Captain Canada, with Eaton fully accepting the moniker and learning that the suit will grant additional powers after he proves himself worthy. Meanwhile, the villainous Mr. Big meets with Canada’s “Super-Mafia” and outlines his plan to kidnap the Queen. Here is the same panel I shared last month featuring the artwork of Danny Bulanadi. The difference is that it is now in full colour, courtesy of Steve Oliff. Oliff would later become a trailblazer in the emergence of computer colouring beginning with his work on the Marvel/Epic Akira series and would win several Eisner and Harvey awards in the 1990s. Some time passes and Eaton picks up a beautiful female hitchhiker, Kelly, who is on her way to Toronto for modelling school. When they stop at a diner outside of Halifax, two criminals mistake Kelly for beauty queen, “Miss Canada,” and kidnap her. Captain Canada intervenes, saves Kelly and delivers the criminals to the Nova Scotia Police Headquarters. It turns out that there is a reward for apprehending said criminals, which Captain Canada then delivers to a local “Crippled Children’s Fund” before using his powers to fly west. Eventually, he is summoned by a gigantic super-powered being named Captain Freedom, who reveals himself to be, “The tribe of tribes. The tribe of the great spirit,” as he takes the form of a stereotypical First Nations shaman. Captain Freedom then proceeds to pass on some of his wisdom to Daniel Eaton before disappearing into thin air. It is obvious that the character is one of Captain Newfoundland’s many apprentices. Captain Canada is summoned by Captain Freedom in what is possibly the province of New Brunswick. Mademoiselle reveals herself to Captain Canada. The third chakra is not a comic story or words of wisdom. Rather it is two pinups by Boris Vallejo—one of the front cover of the graphic novel and another of Mademoiselle. 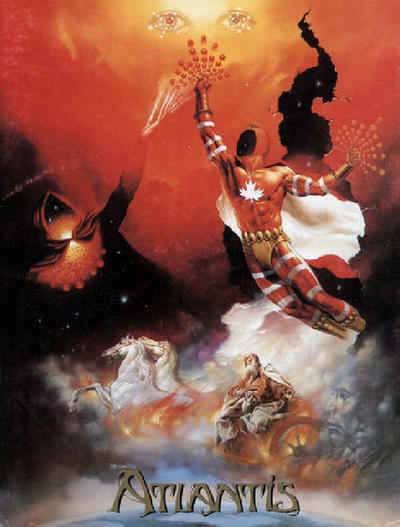 The fourth chakra, “The Place of the Heart,” begins with Captain Freedom and Mademoiselle summoning Eaton in his dreams and warning him about Sho-gun. He awakes and assumes that he was having a nightmare. When he leaves his apartment, he learns that Prince Charles has been kidnapped and is being held for ransom. He immediately transforms into Captain Canada and flies to Northern Quebec seeking Captain Newfoundland. He finds the cosmic-guru, who transports him to outer space and provides him with the “Holy Gospel of Consciousness,” before disappearing. Upon returning to Montreal, Danny Eaton encounters a super-powered woman called Nightworld, who transports him to the astral plane, revealing that a villain named Remlin is being tracked in Canada by Captain Newfoundland’s Japanese apprentice (who is named Japan). 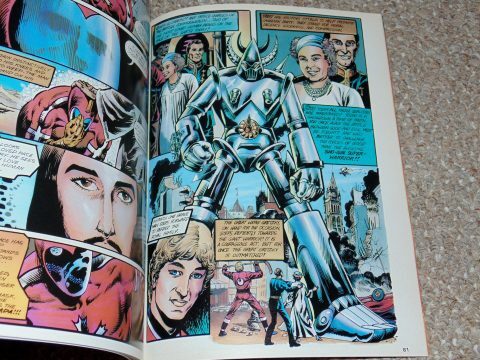 When Eaton is released from Nightworld’s trance, Japan is standing next to him and asserts that Captain Canada must use the Holy Gospel of Consciousness to gain the power needed to defeat Sho-gun. 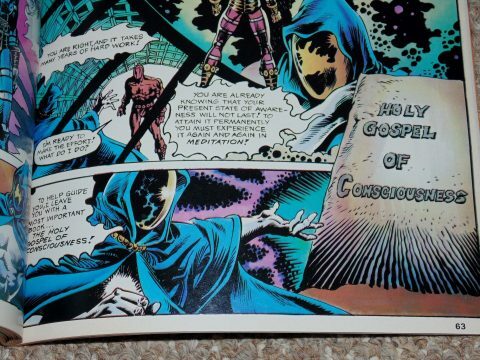 He reads the book, is entranced again, encounters the Goddess Vena and Jesus before waking up with new powers. He realizes that both the Queen and Prince Charles are in Ottawa and flies to the city, which has been leveled by Sho-gun. 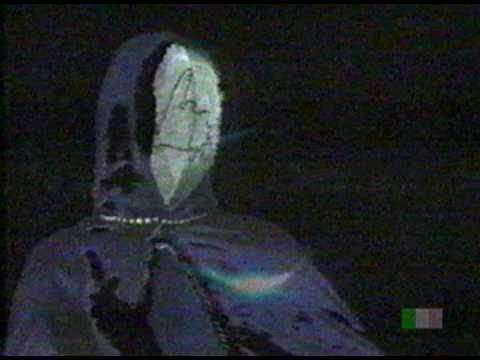 Nightworld, as she appears to Danny Eaton. When he arrives on the scene, the only thing standing in the way of Sho-gun capturing the Queen is Wayne Gretzky (yes, that Wayne Gretzky, in what may be his first comic book appearance). Captain Canada and Sho-gun battle throughout Ottawa with the hero being victorious only after Captain Newfoundland arrives and provides him with additional powers through the astral plane. Remlin is revealed to be the evil sorcerer, Merlin, and Captain Newfoundland fights him in the astral plane, while Captain Canada saves the day. The graphic novel ends with Captain Canada becoming Canada’s greatest superhero and the epilogue reprints the section from Captain Newfoundland # 1 where the NTV reporters start tracking the flying saucer. The only thing standing between Sho-gun and the helpless royals is Wayne Gretzky. Ultimately, the majority of what happens in the first comic book is ignored. 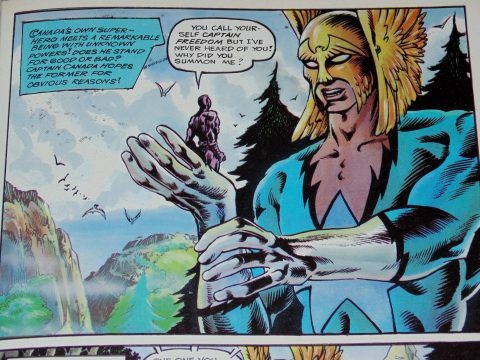 Neither Kundalini nor Captain Silver are mentioned anywhere in the graphic novel and the only appearance of Golden Dove is in the reprinted Leif Erikson story. Perhaps the authors intended to retcon these stories, but it is also possible that they planned to continue them in future releases. It is possible that they did so, but until a copy of the rumoured third volume, The Legend of Captain Atlantis, turns up it is impossible to know. 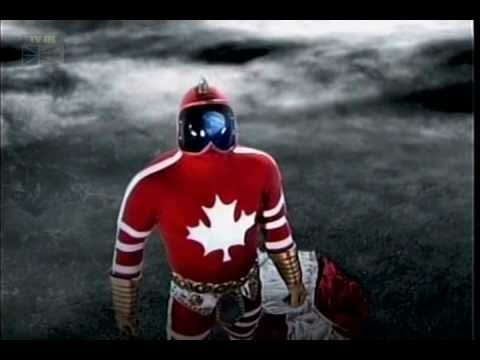 Captain Canada as depicted in an NTV advertisement from the first decade of this century. Nevertheless, the Stirlings did not abandon the character outright and Captain Canada has been used in promotional material for NTV as recently as 2010. The comic strips and subsequent comic books were not the only material that they created during the height of the popularity of Captain Newfoundland. Indeed, a rarely seen television movie was released in the 1980s. Only the introduction of the film is still available online and I have not had the pleasure of seeing it. 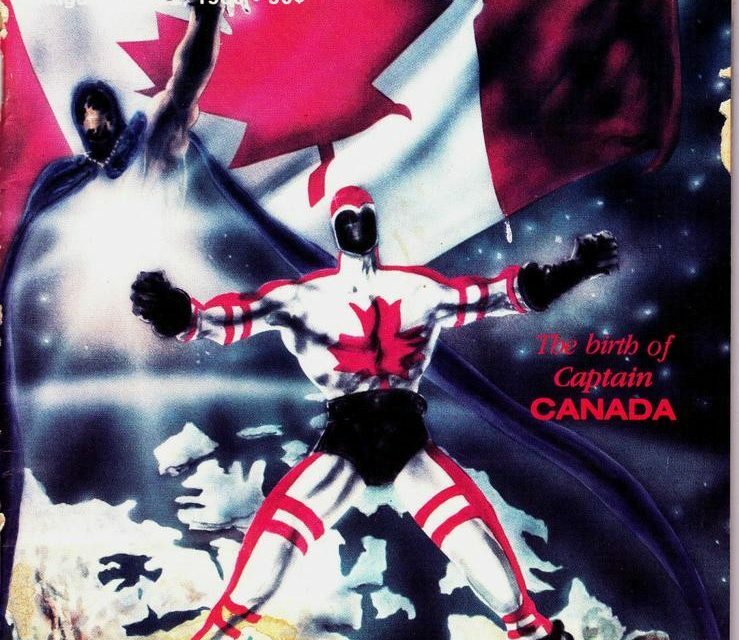 From what I can ascertain, the film focused on Captain Newfoundland, Kundalini, Captain Silver and the Golden Dove (though it is possible that Captain Canada appears). Supposedly, NTV plays this film late at night on occasion, but since the station caters to residents of Newfoundland, I assume that the film is rarely seen outside of the province. There is no evidence that the film has ever been released on home video (VHS, DVD or otherwise). I think it would be fun for one of Atlantic Canada’s major conventions (such as Hal-Con, the East Coast Comic Expo, Avalon Expo or Sci-Fi on the Rock) to show the film. I may lobby one or all of these conventions to do so down the road. Captain Newfoundland as depicted in the live-action film from the 1980s. Considering that Captain Newfoundland is the comic hero embodiment of Geoff Stirling’s mystical philosophy, it is likely that there are other collectibles and ephemera associated with the characters that I have never seen. The reality is that it is quite difficult to find this stuff outside of Newfoundland. That said, Captain Newfoundland has become one of the most talked about superheroes from the Canadian Silver Age because of how bizarre and ambitious the project actually was. Media outlets with radically different audiences such as The Globe and Mail and Vice have covered the character over the past few years, but only in a cursory way. Few Canadian comic book collectors have had an opportunity to read these comics and this is almost certainly due to the comics only being available in Newfoundland. Cover of The Newfoundland Herald from Feb. 20-26, 1983. Artwork by Boris Vallejo. This is reprinted as the inside back cover of the Atlantis graphic novel. Image from a long-ended eBay auction. I have not seen copies of The Newfoundland Herald that feature the character come up for sale in the three years that I have been tracking comic sales. By the late-1970s, the weekly paper had essentially become a television and film guide (along the lines of TV Guide). As such, it was a disposable publication. Even so, several of the issues have covers featuring the comic characters drawn by Danny Bulanadi and later Boris Vallejo. 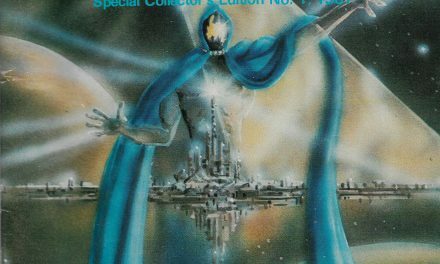 Some of these covers are reprinted in Atlantis, but there are others that were not. Issues of the publication that feature such covers should certainly be on the radar of collectors. 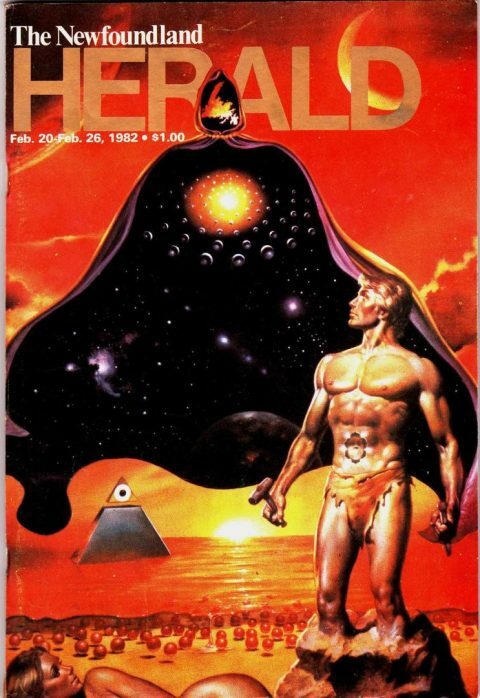 Only time will tell what their value might be, but never underestimate the willingness for Boris Vallejo (and even Frank Frazetta collectors) to pay large sums for Boris works that they do not already have. 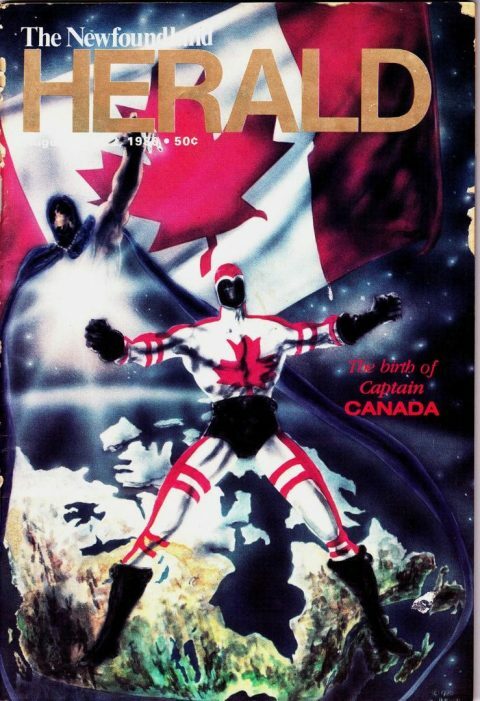 Cover of The Newfoundland Herald featuring Captain Canada from 1978. Image from a long-ended eBay auction. The two comics are themselves quite scarce. This is somewhat surprising because we assume that Captain Newfoundland # 1 had a sizeable print run for a Canadian Silver Age comic book. Our assumption is based on the fact that the Atlantis graphic novel sold 10,000 copies and that the Stirling Communications media juggernaut had the capital and publishing expertise to print these comics cheaper and in larger quantities than most comic creators in Canada at the time. We do not know how many copies of Captain Newfoundland # 1 were printed, but we suspect that they were printed in the thousands. Such large print runs should make these comics much easier to find, but they rarely come up for sale, even in Newfoundland. All of this makes it difficult for me to believe that the third comic in the series was ever released, though I am hopeful that one will shake loose soon if it was actually published. Over the three years that I have been tracking both comics, there have only been a handful come up for sale and, as I write this, I am unaware of any copies that are currently on offer. Of the two, Captain Newfoundland # 1 is the harder to find and achieves the higher actualized sale price. I have witnessed four copies of the comic come up for sale on eBay since 2016, with the most recent specimen appearing in August, 2018. The best looking of the four sold in 2017 for nearly $500 CAD. Another copy that was in low grade sold at the beginning of 2018 for approximately $50 CAD. The copy that sold in 2016 was mid-grade and sold for slightly over $100 CAD. I purchased the copy that sold in August, 2018 for $100 CAD and it is also mid-grade. Most, if not all, of these specimens were sold by dealers located in Newfoundland. Given the occasional media exposure granted the comics, it is not surprising that the first issue of the series has consistently achieved high sale prices in comparison to other Canadian comics from the era. Atlantis is similarly difficult to find, but does seem to come to market more often than its predecessor. I have owned two copies of the graphic novel (one of which I provided to Dan Bryantowich at cost when we met up in Ottawa in 2017). Mid-grade or higher copies tend to fetch around $50 CAD. I have seen several specimens achieve similar prices on eBay and elsewhere. To my surprise, the majority of the graphic novels that I have encountered were not located in Newfoundland. Indeed, my copy was purchased from a dealer in Ontario and the one I procured for Dan was found in Halifax (go figure!). 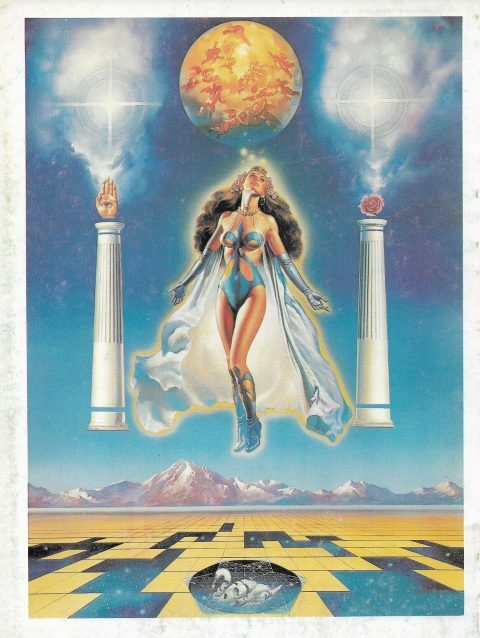 Back cover of Atlantis featuring the character Mademoiselle. Artwork by Boris Vallejo. It is difficult to say whether or not either of these comics are solid investments for collectors who are concerned about such things. Neither comic appears in the CGC census, so at this time there is no such thing as a highest-graded example. Given that Atlantis had a large print run and that we assume that Captain Newfoundland # 1 also had a sizeable number of copies printed, it is entirely possible that there is a large cache of these somewhere that has yet to be uncovered. However, I prefer to avoid hypotheticals. At the moment, both comics are scarce and do not last long when they come up for sale. I had hoped to procure a cheaper Captain Newfoundland # 1, but was sick of waiting and the utility of ownership directed my decision to strike. I am glad I did, as I have not seen another one come up for sale for the past six to seven months. More importantly, these comics are superb pieces of Canadiana and are among the best comics created during the era. 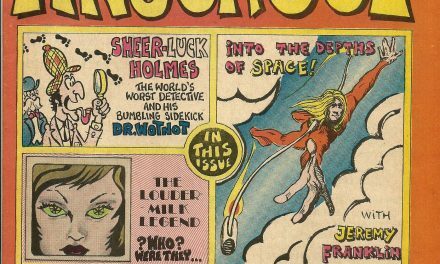 What makes these two comics special is multi-faceted for collectors of the Canadian Silver Age: the comics are delightfully strange and exist as a manifestation of Geoff Stirling’s philosophical leanings. 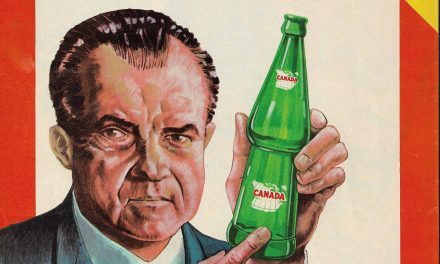 These comics are the culmination of decades worth of the elder Stirling developing his political and philosophical worldviews that resulted from his upbringing, his involvement against Newfoundland joining Canada, his slow build towards becoming a media mogul and his adventures with John Lennon, Joey Smallwood and Swami Shyam. 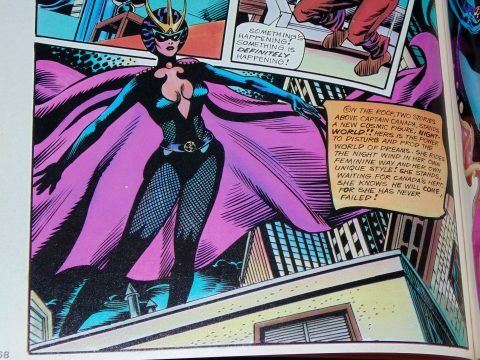 The comics themselves were well-written, professionally drawn and printed to a high standard. 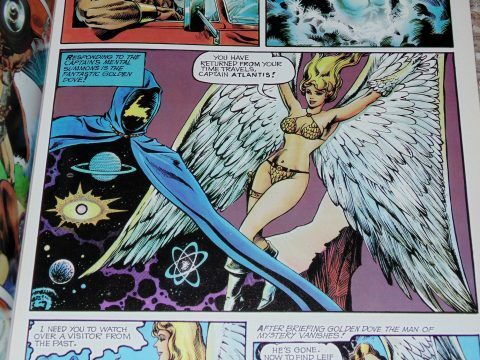 Where else can you find the work of Danny Bulanada, Boris Vallejo and Steve Oliff together in a comic book? If you can find these comics, buy them. You won’t be disappointed. Just picked it up, brian. Thanks. No problem, Ivan. I hope you enjoy it.